As parents, we hear a lot about the importance of tending to our children’s physical and cognitive growth. Spiritual growth receives less attention but is also an important part of human development. At the same time our children are experiencing rapid growth, we encounter God in new ways when we become parents. We experience the miracle of new life and the wonder of unconditional love through our children. Children’s Ministry at Kenilworth Union Church seeks to equip parents and children as they live and grow in faith. The 9 a.m. worship is an opportunity for families to participate in church together. Bill Evertsberg shares some of the changes being made to that service in this blog post. During the 10:30 a.m. hour we offer age-level opportunities for children to engage with scripture, prayer, and worship in chapel. 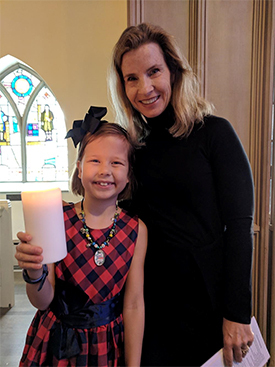 This newsletter and seasonal devotionals for Advent and Lent provide an opportunity for families to practice faith at home. Wednesday night youth groups and choirs nurture relationships and turn us toward God during the week. Quarterly P*Wee Club and Kids 4 Kids Club offer an opportunity to respond to God’s love for us through acts of service and compassion. Vacation Bible School is an opportunity to learn and grow together in one joy-filled week. Our hope is that this variety of offerings meets family schedules where they are. Please take a moment to mark time in your calendar for faith formation. Blessings in this new year!